Thank you to everyone for your patience while I have been getting back on track after my unfortunate incident one year ago tomorrow. For those who don’t know, I had a massive brain bleed which required two surgeries and a very long recuperation. Happily, I am back and, I hope, better than ever! I am not promising daily blog posts, as I did in the beginning. (What was I thinking?) 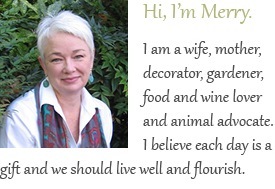 But I am excited about getting back to sharing inspiration and ideas to help us all FLOURISH! 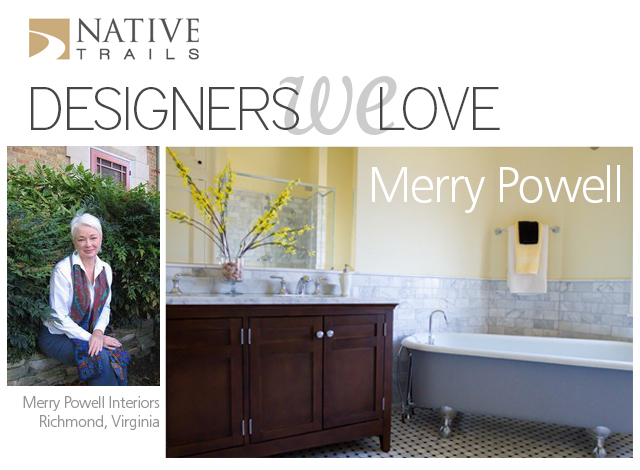 Recently, I was contacted by Beth Fillerup at Native Trails, the premier maker of gorgeous hand hammered copper sinks, about doing an interview for their newsletter. I was honored to participate and am so pleased with the finished product that I wanted to share it with you. Click the photo, below, to access the full article. Again, thank you all…for your patience, prayers and good thoughts. I look forward to reconnecting with each of you! If the warm weather is making it difficult for you to get into the spirit of the season, I have the solution. Plan to attend the Historic Fredericksburg Foundation’s 42nd Annual Candlelight Tour this week-end, December 8 and 9. Spend the day in beautiful, historic Fredericksburg, Virginia. 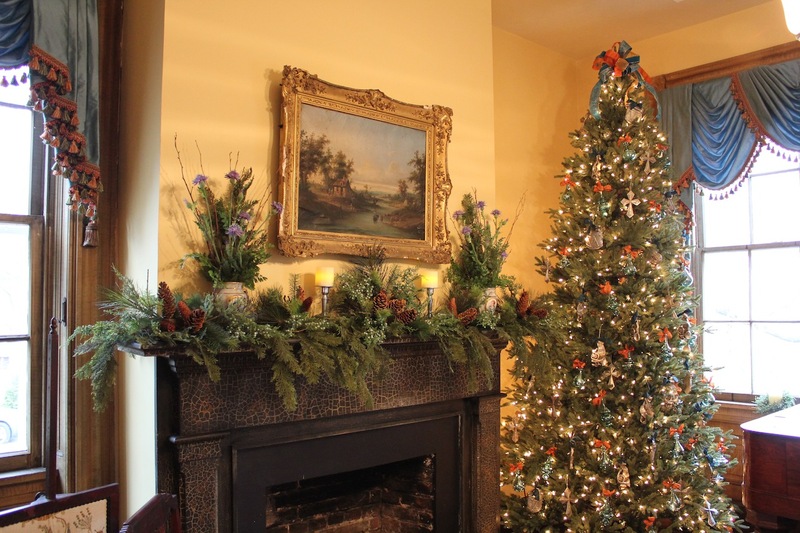 Enjoy guided tours of five professionally decorated historic homes, including Braehead Mansion, decorated by Merry Powell Interiors. Greens native to Virginia adorn the mantels. These are some of the finest homes in Fredericksburg bedecked in their holiday finery. Visit http://www.hffi.org/eventscalendars.html for information on times, tickets, etc. Be sure to allow time for shopping in the historic district. You will find one-of-a-kind gifts in the galleries, antique stores or the Gift Shop for the Candlelight Tour. Grab a bite to eat in one of the many cafe’s and coffee shops. Enjoy the holiday street entertainment. Before you know it, you’ll be humming “Jingle Bells”! 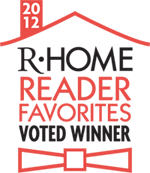 Special thanks to my amazingly talented Design Team, volunteers Michelle Bristow, Jackie Mason and Grace Riley. Braehead is glowing with holiday light thanks to your hard work. I could never have completed this project without you. Are you eager to start your Christmas decorating but feel it’s a bit too early to put up the tree? Here is a project you really must do right now. The timing is perfect to plant some paperwhites. If you get this project completed within the next couple of days, you should have lovely, fragrant flowers blooming for Christmas. Paperwhite bulbs (Narcissus Papyraceus) – Look for fat bulbs with no soft spots or mildew. Try to find loose or bagged bulbs so you can see what you’re buying. Avoid bulb kits which include a container, bulbs and soil. Check a good garden center. Live moss (optional) I harvested mine from my yard. If you have a stone or brick wall in your garden, you probably have moss. Just peel some off. You can also use dried moss available at craft stores. Add gravel to your hurricane to make a depth of 2 – 3”. Set bulbs, pointed end up, into the rocks. Don’t be afraid to crowd them a little. Add a few more pebbles or larger rocks to secure the bulbs, but don’t bury them. Add small bits of moss, if desired, for contrast. Just tuck lightly between some of the rocks. Don’t cover the rocks completely, and try to avoid too much contact with the bulbs, as this may cause rot. Now add water. Dampen the moss as you do so. Watch the level carefully. You want the water to just barely touch the bottoms of the bulbs. Now place in a sunny spot and watch the magic! You will need to add water, perhaps daily, to maintain the proper level. 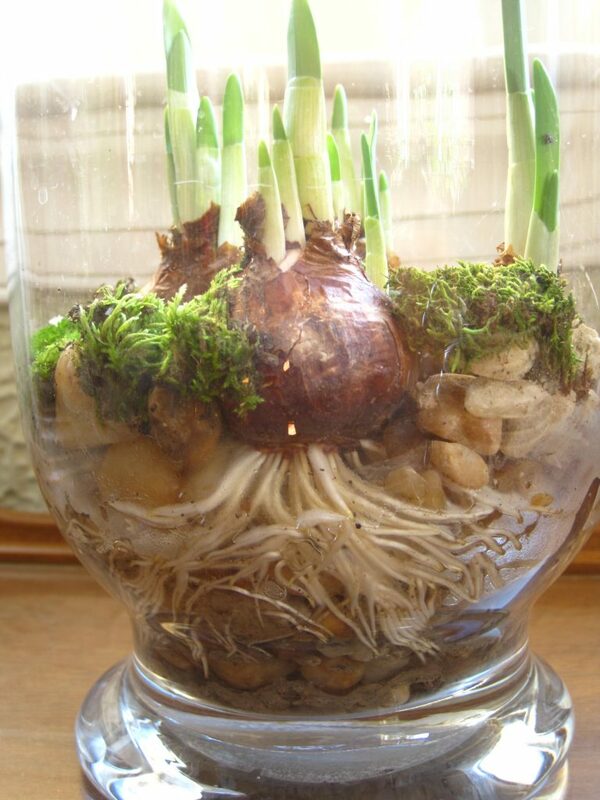 Growth will start almost immediately and flowers can be expected in about 4 weeks, depending on the health of the bulbs and the available sunlight. 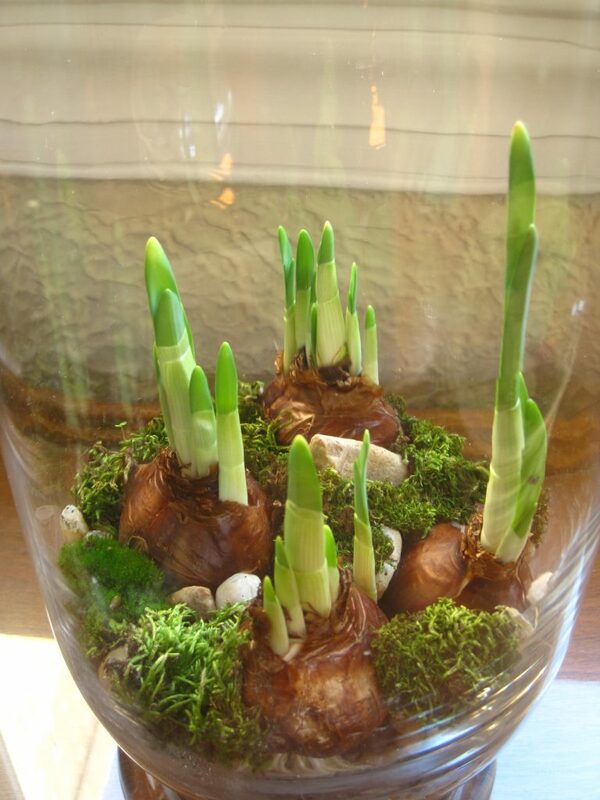 Paperwhites can be grown in almost any water-tight container. But, because the bulbs are not buried deeply into the soil, the flowers and foliage can be expected to fall over without support. 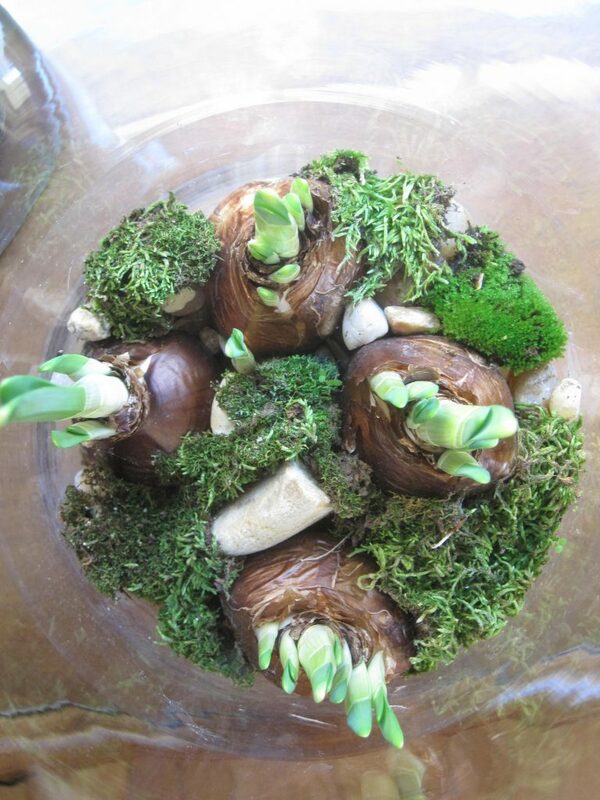 That’s why I’ve chosen to plant my paperwhites in glass hurricanes this year. The plan is that the sides of the vase will hold up the plants. We’ll see…I will post a picture once they bloom. This project is great to do with children. They can help with the planting and will be amazed to see how quickly the plants grow. 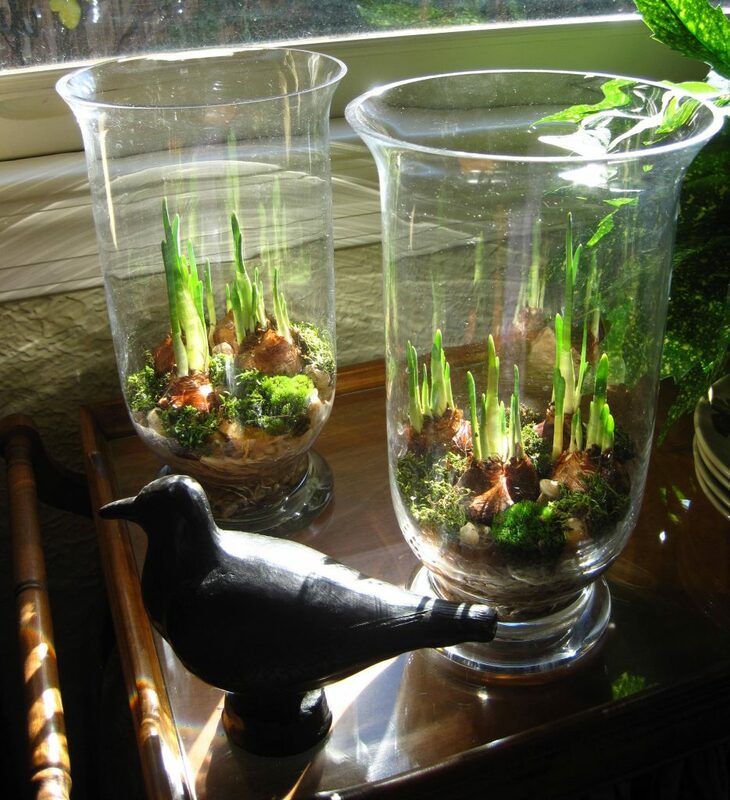 Since these are planted in clear glass containers, the roots are visible, too. It’s fascinating to see how quickly they fill in between the rocks. Autumn will officially arrive on Saturday, September 22nd. This is the season that defines a color palette and excites the senses. The mountains of Virginia virtually ignite when the sugar maples, poplar, beech and hickory trees show their true colors. Pumpkins and gourds mingle with Indian corn and spicy apple cider at road-side market stands. This is the time to plan a road trip, but not an itinerary. Just drive leisurely through the countryside and stop when the spirit moves you. Pick some apples, feel the crisp breeze on your face, taste some wine, buy a gigantic jack-o-lantern to be! The peak time for leaf peeping is a few weeks away. 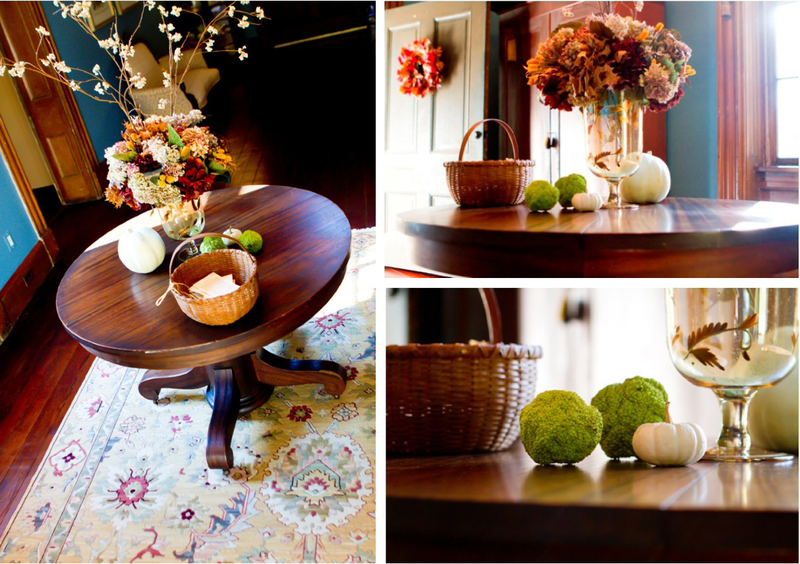 So, in the mean-time, bring some autumn into your home with these easy ideas. 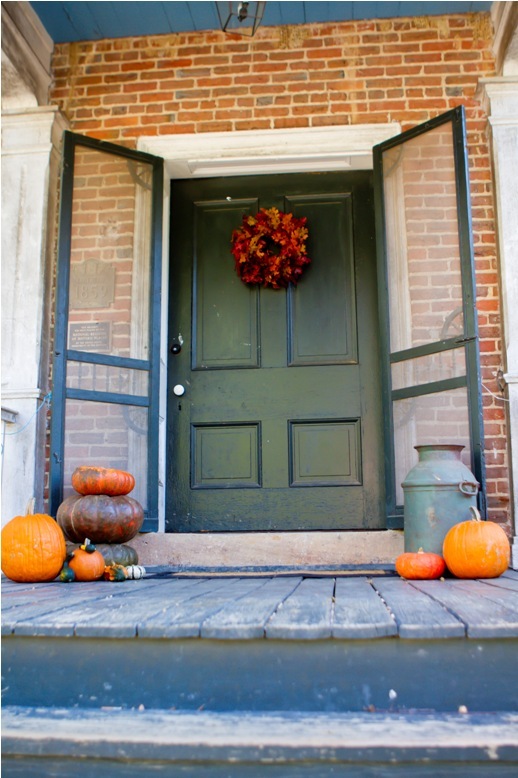 Start at the front door with a leafy wreath and a collection of pumpkins. Choose flat ones in various colors to stack, and a few round ones, too! Think beyond mums! Use gourds, pumpkins, dried corn, branches and leaves. 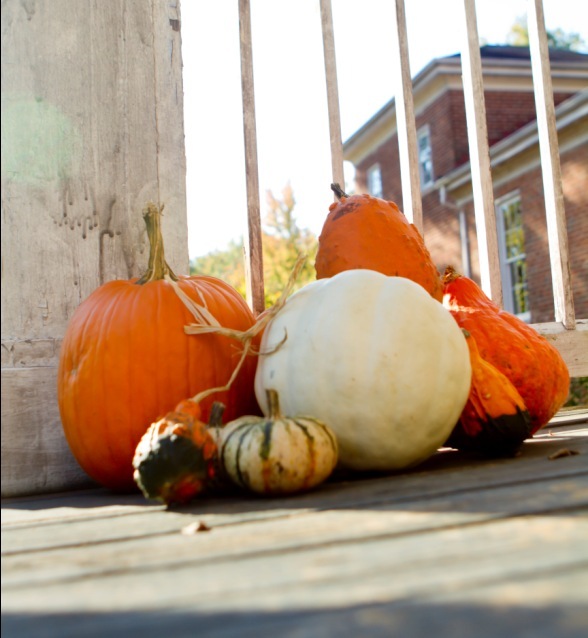 A simple collection of pumpkins and small gourds can adorn a deck or porch. 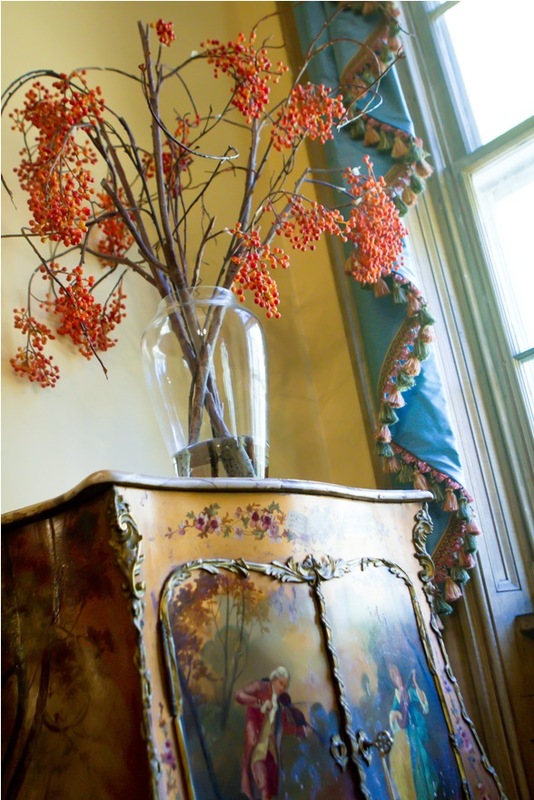 A few berry branches create a dramatic arrangement. 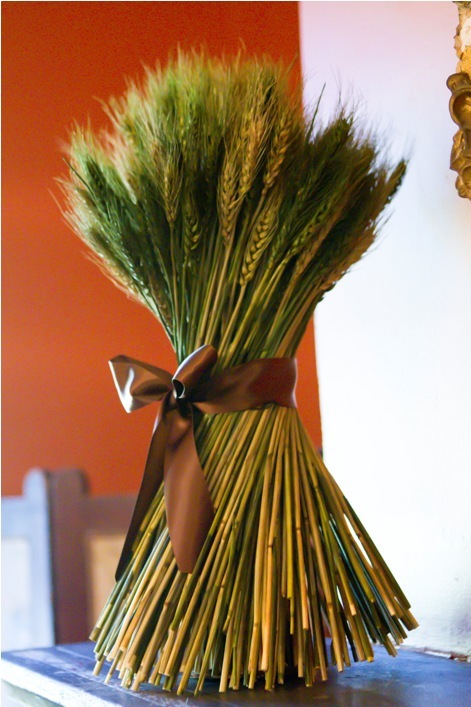 A bunch of wheat tied with a satin ribbon is a quick way to add autumn texture to a table or mantel. 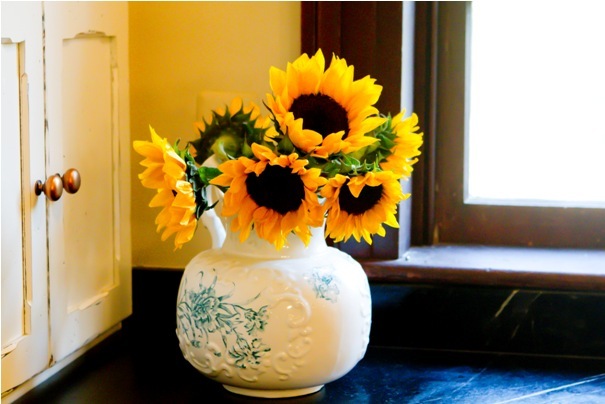 A half-dozen sunflowers in an antique pitcher add a splash of autumn sunshine to a kitchen counter. Pie size pumpkins are perfect to place in a row on a mantel or across the top of a doorway. 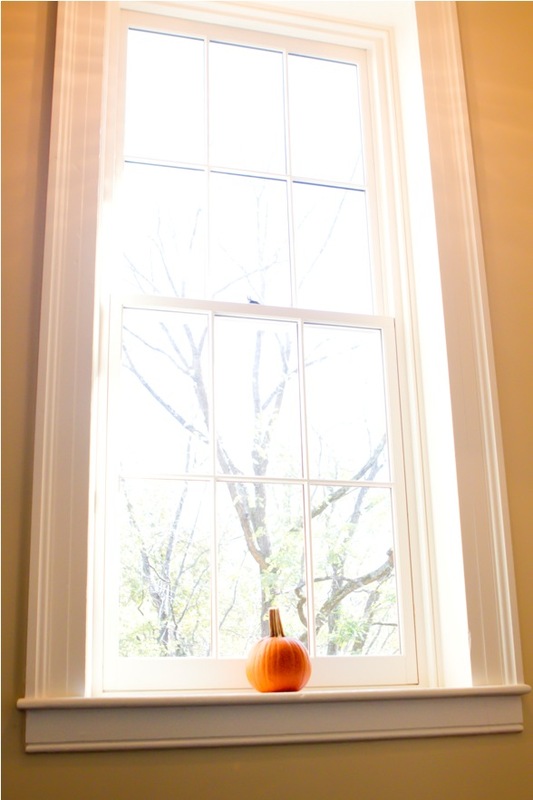 A single pumpkin is all that’s needed to adorn a window sill, bookcase or end table. A mini pumpkin next to the faucet in a guest bath or powder room is a simply elegant touch. 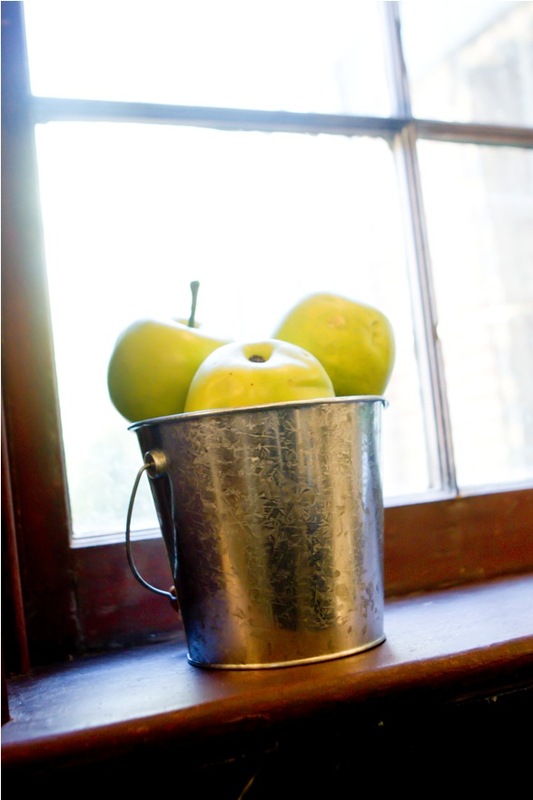 Display your autumn produce in a basket, bowl or bucket. Mix natural materials with artificial. Already have a floral arrangement you like? Add some branches or pheasant feathers to make it feel more seasonal. 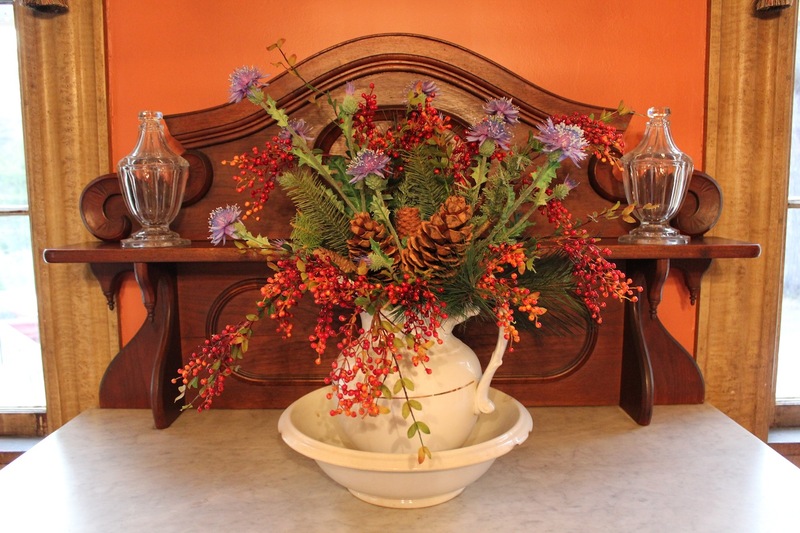 Pine cones, nuts and seed pods from your garden can all be incorporated. An arrangement of dried hydrangeas, oak leaves, pods and tallow branches create a still-life on a foyer table with small white pumpkins, Osage oranges and a small basket to catch the mail. Use your imagination to bring some of Autumn’s splendor into your home, but remember – keep it simple. A single branch pruned from a shrub or tree, a bowl of walnuts, a glass hurricane filled with tiny lady apples or mini pumpkins…simply beautiful…simply autumnal. Summer may be coming to an end, but the deals at One Kings Lane are not! Shop the One Kings Lane Labor Day Blowout sale today and stock up on beautiful new items for your home. Check out the great deals on everything you need to spruce up your home for the fall, for every room in your house! If you’re new to One Kings Lane, sign up today for a $15 credit for purchases of $30 or more. Head over to One Kings Lane today before these deals over! See the One Kings Lane link at the lower left of this page, or click here: One Kings Lane to start shopping!